Often times, the entryway, entry closet, or mudroom becomes a dumping ground for all things coming into the house. It is natural to want to throw things down the moment we walk in after a long day, but if those things never find their way to a designated home, the result can be a huge mess. The solution? If you assign items a home in the entry closet or mudroom, they will be more likely to stay right where they are supposed to. 2. 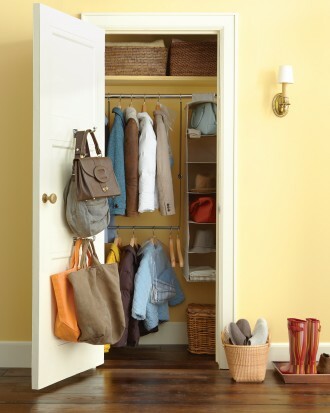 Go into your mudroom or entry closet and clean out anything that does not fall into the “top priority” category. However, you may want to keep a few additional items that would be useful when running out of the door, such as – an umbrella. 3. Once you have removed the excess items (returned them to more appropriate homes elsewhere in the house or let them go), assess the space. Each family member may have room to keep a couple of jackets they are currently wearing, a handful of accessories (hats, gloves, or scarves, depending on where you live), a pair of outdoor shoes (like rain boots), and their backpack or purse. 4. Now that you have determined what belongs, it’s time to assign homes. Installing hooks on the back of an entry closet door will provide a perfect place for backpacks and purses. Hang jackets in the closet and have a bin for accessories. If you have a mudroom, backpacks and jackets all may go on hooks. Shoes can be placed in bins underneath or on any lower shelving. Since everyone is working with their own unique space remember to be sensible when placing items.. If items are difficult to access, any organization will quickly unravel. 5. An extra “home” to consider is a bin or space specially designated for items that need to be returned to or taken out of the house. A designated holding spot allows for easy access when you’re running out the door. 6. An entry closet or mudroom should aid you in getting out of the house with all your essentials in tow and give you a place to return items when you come home. Having a thoughtful place for these items saves time and stress when needing to get out quickly. Spend the two minutes to put things away properly. I promise it will be worth it! Click here for more entry way and mudroom inspiration!